Isaac Brock was born 6 October 1769 on the Isle of Guernsey, the son of a navy midshipman. He excelled in school, including studying French, and in many sports. As he matured his ideas turned to the military and in 1785 he joined the 8th Regiment of Foot with the rank of ensign. As was the standard at the time his family purchased his commissions, but he also showed great promise as a commander, and by 1791 he was promoted to a captain in the 49th Regiment of Foot. His first command came in 1797 when he purchased the rank of Lieutenant-Colonel and led his regiment in the Helder Expedition in what is now the Netherlands. During this campaign he was wounded in the neck but lived to fight another day. In 1801 Brock’s command was sent to attack forts at the Battle of Copenhagen in Denmark. A great sea battle fought by Lord Horatio Nelson, Brock’s attack was called off as unnecessary, but he learned a lot of tactics by watching Nelson. 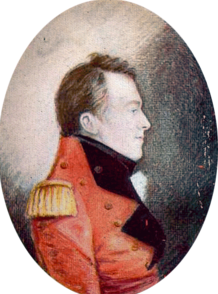 In 1802, Brock and his command were sent to Canada and was initially assigned to Montreal. Almost immediately, in 1803, he was faced with one of the primary problems in Canada: desertion. Seven soldiers stole a boat and fled across the border into the United States. Despite having no jurisdiction on American soil, Brock sent a party across the border in pursuit and the men were captured without incident. Mutiny and desertion, unfortunately were not rare happening in the British army at the time. Conditions were harsh, provisions were inconsistent and discipline was sometimes over the top. 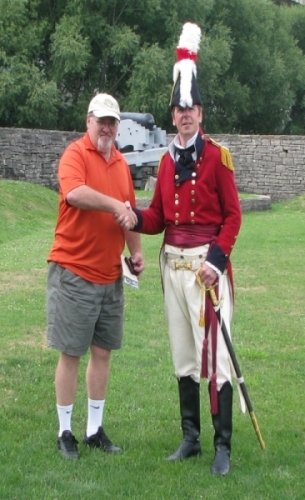 In 1804 Brock was faced with a potential mutiny and desertion of seven soldiers and twelve mutineers at Fort George (Niagara-on-the-Lake). While the severe treatment of the men under the command of L-Col Roger Sheaffe was the cause of the uprising, through a series of missteps by Brock’s officers, all the conspirators were shot. Brock traveled to England during the winter of 1805-06 and on his return to Canada he found himself in command of all British troops in Canada and now a Colonel. The war drums in the U.S were beginning to beat by late 1806 caused by the rhetoric of the War Hawks in Congress. In 1810, fearing war, the Governor General of Canada, Sir James Henry Craig, promoted Brock to Brigadier General and gave him formal command of the troops in Upper Canada (Ontario). In 1812 he was made also the head of the civil authority and he set about to ready for war. These preparations and Brock’s instance that officers, including him, must fight from the front and not from the rear, made Brock into the leader he was in the day and contributed to the legend he is today. Indeed, Brock’s actions, particularly his success at Detroit, earned him a knighthood, membership in the Order of the Bath, accolades and the title of “The Hero of Upper Canada”. Brock was killed at the Battle of Queenston Heights, while leading from the front, on October 13, 1812.